This is an upcoming magazine cover I did for Robert Tracinski's The Intellectual Activist. 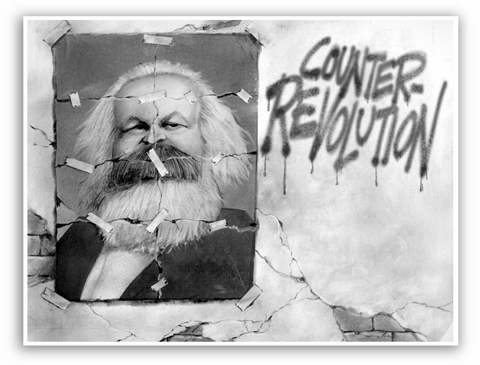 The main article is a discussion on how Marxism is creeping into mainstream America. NOTE: The wall space under the graffiti is where additional copy goes. I have a sort of vision of a Marx (or Obama) portrait painted on the underside of the top plate of a machine press. Society is on the lower plate. The dumb masses are in a frenzy, cheering as the portrait draws closer. There are those who are trying to brace for the inevitable--but in vain. Masses, dumb-masses, they all fall down. The tape holding Marx's picture together says a lot. Is it just me, or does "Uncle Karl" bear a disturbing resemblance to the Haddon Sundblom Santa Claus? Too late, folks. We're in the boat now. This page contains a single entry from the blog posted on November 5, 2008 11:42 PM. The previous post in this blog was PROPHETIC. The next post in this blog is Obamanation.